I'm still not sure if this gator is sitting on a nest or if it was just a resting place. She doesn't look rested and didn't like me being nearby. It looks like a nest and she acts like it's a nest but I've never seen one built in such a precarious and exposed place. I didn't have the time to observe it long enough to find out and I really don't like agitating animals, especially when they are nesting or feeding. In the long run it doesn't matter whether it is or isn't, it's a beautiful gator and a beautiful setting. 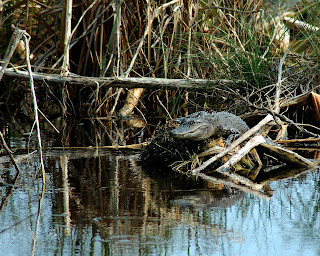 I took this photo in the St Marks National Wildlife Refuge which is located on the gulf in the Big Bend area of Florida.